Shop and earn free tickets to see Sean Chen with the Carmel Symphony Orchestra at the Palladium on Saturday, March 10 at 7:30 p.m.
From the captivating chase of the hounds in Franck’s “The Accursed Huntsman” to the beautiful, slow movement of Brahms, our March concert promises to stir your emotions and perhaps even get your heart racing. With the incomparable pianist Sean Chen returning to The Palladium as guest artist, this performance is sure to be an audience favorite. 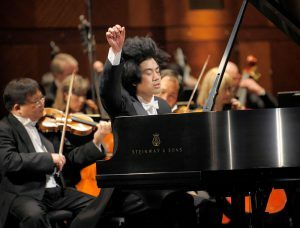 Hailed as a charismatic rising star with “an exceptional ability to connect with an audience combined with an easy virtuosity” (Huffington Post), 29-year-old American pianist Sean Chen, third prize winner at the 2013 Van Cliburn International Piano Competition and recipient of the DeHaan Classical Fellowship as the winner of the 2013 American Pianists Awards, has continued to earn accolades for “alluring, colorfully shaded renditions” (New York Times) and “genuinely sensitive” (LA Times) playing. Sean was recently named a 2015 fellow by the prestigious Leonore Annenberg Fellowship Fund for the Performing Arts. From now through March 9, shop for CSO tickets at Bath Junkie, Addendum, Fishman Fine Jewelers and Endeavor Boutique. Spend $50 or more and receive two ticket vouchers to the performance. Dine at Books & Brews, Matt the Miller’s Tavern or divvy at Carmel City Center before the show and then grab a sweet treat from Graeter’s Ice Cream afterwards and make it a date!